Stunning colour in clasically detailed pots. Treat your garden to a bumper display of gorgeous lily blooms this summer. Complete with a set of 5 pots to bring out the best in your blooms, creating a designer-style effect in no time at all. An absolute must-have if you love your cut flowers, the blooms also look spectacular if left to flower in their pots. This gorgeous mixture is ideal when placed either side of doorways, gateways and pathways or around patios. Supplied as a set of 5 heavy duty polypropylene planters, 23cm (9in) diameter and 20 lily bulbs ready for immediate planting. 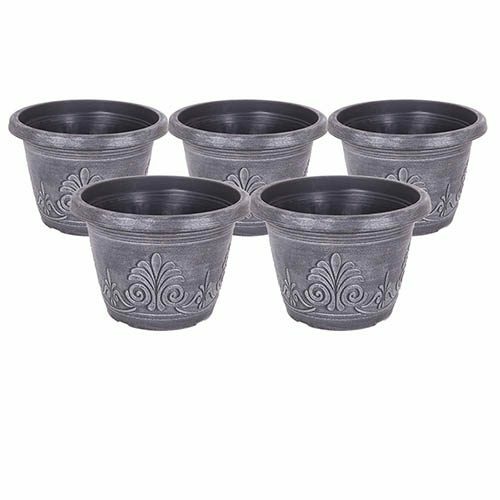 A collection of 5 brushed-silver planter pots and 20 Stargazer lily bulbs to give you a bumper display of gorgeous blooms this summer. Plants look so much better when they’re planted up into a beautiful container - both pot and plants bring out the best in each other, creating a designer-style effect in no time at all. 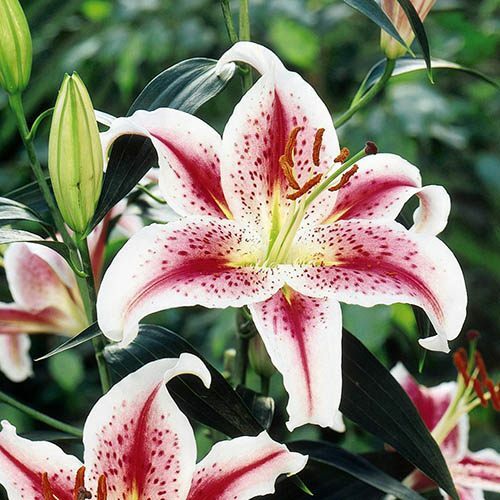 A hybrid Oriental lily, 'Stargazer' is well-known for its beautiful colour and heady perfume. An absolute must-have if you love your cut flowers, the blooms also look spectacular if left to flower in their pots, and will grow to around 1m in height, adding real wow-factor to your garden. This gorgeous mixture is ideal when placed either side of doorways, gateways and pathways or around patios. 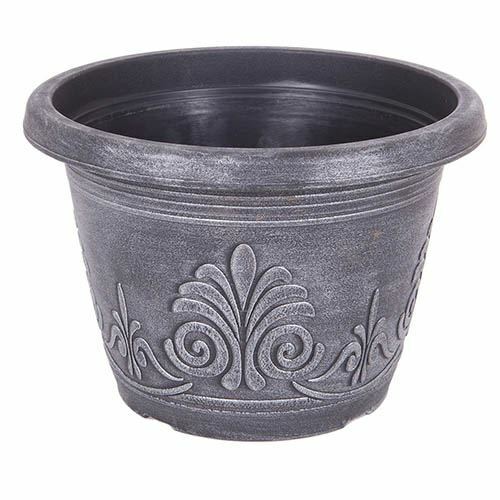 A brushed-silver, inverted Laurel design creates an elegant effect that will really highlight your beautiful plants – and at a fraction of the cost of solid metal or pottery. Made from durable and hardwearing plastic, the pots are frost and UV resistant, so you’ll be able to use them again and again and with raised drainage holes and water reservoirs inside, your plants will thrive every year! 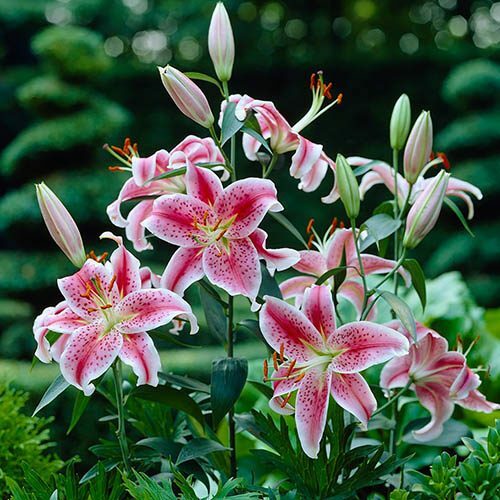 Supplied as a collection of 20 'Stargazer' oriental lilies. Also included; 5 x 9' (23cm) diameter Inverted Laurel brushed-silver planters.